One Sunday morning, me and my cha-bo-lang fetched 3 of our uncles and aunty for tim-sum. Lim peh always like to have conversation with the elderly cos it is through conversation with them that I can learn a thing or two as they are much more knowledgeable than I. After eating some tim-sum, all 5 of us went to a nearby Japanese Supermarket to just walk walk see see look look. While talking and walking aimlessly, especially for me cos I had nothing to buy in mind, lim peh suddenly saw a honeydew melon. My specs almost dropped and my eyes almost pop-out. Why? Look at the price yourself. S$99.00! So what if it was airflown? 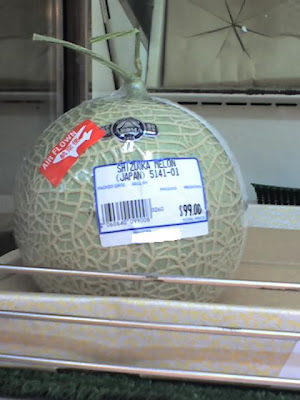 Lim peh will never buy such expensive honeydew melon, eat gold meh? Guess only the RICH will pay such high price for a honeydew melon. It is indeed very expensive! I used to buy a cup of watermelon juice that cost me S$7.90!!! which I think not reasonable, can not "tahan" also. Hmmm, maybe the watermelon juice also air-flown? they are paying to show other people how rich they are. these musk melon are grown organically in well-controlled greenhouse. i happen to sample some at hokkaido, in terms of sweetness & aroma - no horse run *2 thumbs up* still, it's too steep a price to pay for me. Eh... you forgot I love both papaya and honeydew melon so hum-pa-lang also I eat, he he he. Ha ha ha, if after eating can speak Japanese, then lim peh will also buy. Organic one, no wonder so expensive la. Who don't like to tour the world? lim peh no money leh, think can go JB only la. i wonder izzit a typo error? 99 bucks? It´s not a typo error la, really for rich people only. kua leh kong, me go 渣 one time yip zhi mei 奶奶 also no need expensive like that! Anyway Old Beng, the Jap restaurant at e same floor as the supermarket is yummy. should try! Think tomorrow I'll just go there and eat...got craving for their desert now. Where are you referring? Maybe I can go there too? Its call Tampopo, entrance near the cutlery section. The black pig ramen is shoik! You the can! How do you guess the place lim peh was mentioning even though I purposely blanco the name away. Ya lor, I can only see see look look. Singapore only got 1 place selling the melon, I frequent the place quite often. when comes to food...my nose knows the place. muahaha. Yeah, we felt the same way too. Guess Singaporeans are luckier since we can indulge ourselves in so many different kind of cheap fruits. Your blog is very interesting to me, will drop by more often.